How does DNA relate to a gene and an allele? Definition: Gene is a segment of DNA coding for a functional protein. Exact present day definition of gene is “It is a segment of DNA coding for functional protein, rRNA, tRNA and ribozymes” . Alleles are different forms of a gene. This definition may not tell the real story. In genetics, there are many terms that seem to be having the same meaning but are quite different. 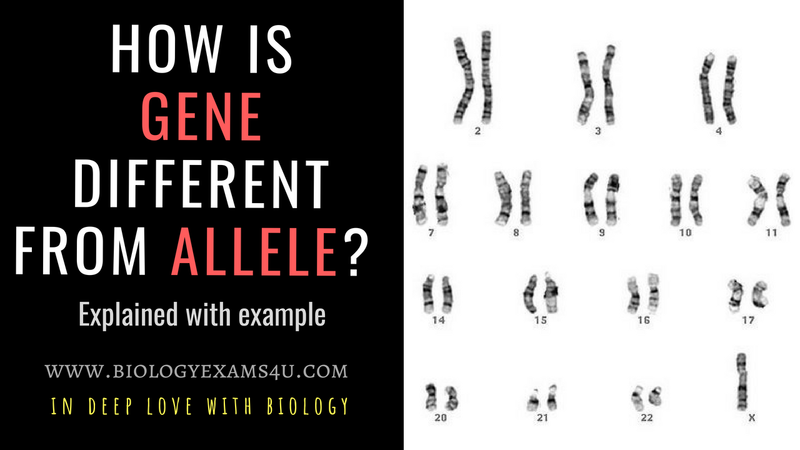 To understand many concepts in genetics, we need clarity about the meaning of such terms in our mind.In this post we are discussing about the terms, gene and allele and I have given the definition above. Red color of rose flower petal is due to a protein. This protein is encoded by a gene. Or in other words gene is a piece of DNA that codes for a protein/trait or character that imparts red color. Figure red rose and yellow rose. Now the next question, what about the yellow color of the rose flowers? Is it’s coded by the same gene? Yes, it is also coded by the same gene. Here comes the term allele. It is the different version of that gene and called allele. The function of the gene is the same, the flower colour. Most often the protein produced may have slight difference amino acid sequence that lead to yellow colour. But this gene is responsible for the trait flower color. Flower color may be red, yellow, white etc. Two or more individuals may be having same genes but different alleles or variants. Actually a diploid organism has two copies of a gene or two sets of chromosomes, one from father’s sperm and other from mother’s egg. The chromosome of similar size and nature often form pairs during meiotic division and such identical chromosomes are called homologous chromosomes. Dark hair color is the dominant trait in humans compared to white hair color. Suppose hair colour is coded by gene A on locus 5 (locus is the physical position of gene on the chromosome) of chromosome number 1. Then the homologous pair also have the same gene at the same position may be designated as small ‘a, or ‘A’. This variant of the same gene seen is called as allele. During gamete formation, the homologous chromosomes with AA or aa genes are separated so that each gamete has either ‘a’ or ‘A’, never both (law of purity of gametes). The gametes of both parents unite to form the genetic constitution of the new individual which may be AA, Aa or aa for that trait hair colour. The phenotype or hair color for the resulting individual may be dark (AA homozygous dominant/ Aa heterozygous condition) and white in homozygous recessive condition ie. ’aa’. Thus, the combination of alleles determines the expressed character. Rightly speaking we have 2 copies of the same gene (that is why called as diploid) one from the father and one from the mother. Thank you for that clear explanation and examples.